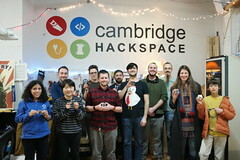 Membership at Cambridge Hackspace costs $75 a month, and gives you 24/7 access to our workshop and tools. You also gain access to the imaging studio on the 2nd floor and its lighting equipment, printers, etc. Non members can visit on our Tuesday night open evenings. It's a great way to see the space, meet our members, and share what you are working on. Our tools are reserved for our members, so if you want to start using our laser cutter, or 3d printers, you'll need to become a member. Membership runs monthly, and you can stay for as long as you want. Just let us know when you want to cancel, and your membership will expire at the end of your billing period. 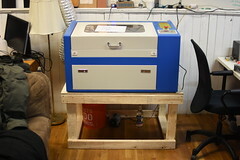 The laser cutter costs $0.40/min to use, or $0.20/min if you put down $100 upfront. Training is needed for all our bigger tools, it's free, and just needs to be arranged with our training team once you have joined. Lastly, we don't offer a laser cutting or 3d printing service to build your project for you, all our tools are self serve. However, you'll find our community a good place to ask questions, get feedback and direction to get working on those tools yourself.